New residential solar PV projects are eligible for federal and state income tax credits. Your Installer Partner has detailed the amount of these credits in your project contract, and should have also provided the tax credit form numbers - Federal Form 5695 and State Form IT-255. For these forms, the qualified solar electric property costs or expenditures is typically the total project cost minus the NYSERDA rebate and the Solar Tompkins rebate. As a result in this approach, the NYSERDA and Solar Tompkins rebates are not treated as taxable income. Tompkins County and most of the municipalities and school districts in the county are opted into New York State’s property tax exemption for solar and wind energy systems (RP-487). This provides exemption from property tax increases due to your solar system for a 15-year period. You should submit the tax exemption form to the Tompkins County Assessment Office to register your property for the exemption. Here is the form, RPTL 487: Tax Exemption of Solar or Wind Energy Systems. For the system description, most customers typically list the system size and location - i.e. 7kW roof-mounted solar PV system. For cost, we recommend listing your actual final cost and attaching the summary page of your contract, and you can ignore the incremental cost line as that is for solar systems that replace building materials. Mail to: Tompkins County Department of Assessment, 128 E. Buffalo St., Ithaca, NY 14850, or email to: assessment@tompkins-co.org. If you live in a neighboring county, the same form applies, but simply mail or deliver it to your local assessor. All solar projects purchased upfront or through a loan should be added to your homeowner's insurance policy. The solar panels 25 year warranty from their manufacturer covers degradation and any production issues, but that warranty does not provide coverage for damage caused by extreme weather, fire, vandalism, or accident. Most insurance companies are familiar with solar these days, and will add your solar system to your homeowner's insurance for $15-40/year. The total value of the solar should be added before any of the incentives and tax benefits, since that's the replacement cost. If your insurance company has any questions, please feel free to reach out to your Installer Partner or Solar Tompkins to help answer them. For residential solar systems, your net-metering credit rolls over from month to month as kWhs, but your account is trued up and cashed out once a year at the wholesale electricity price. This date is your Anniversary/True-up Date. 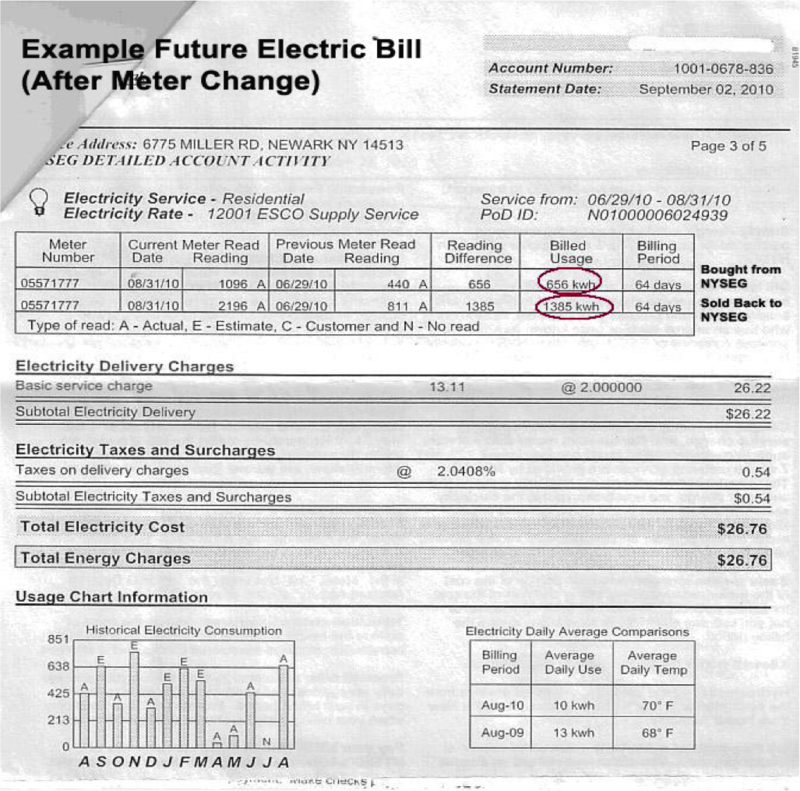 To ensure that you get full economic value for your solar, the most appropriate time of year for this date is typically March or April (when you have typically used up all of your net-metering credit from the summer before), but by default this date is still set by NYSEG as the month and day of your final interconnection approval. Thus, all solar customers should check their default date, and change it to March or April. Remember that you don't actually choose a singe date, but rather a month. If NYSEG currently checks your meter late month, then you would want to choose March for your Anniversary Date; if early-month, then you’d choose April. You need to request this change by sending an email entitled "Solar Customer Contract True-up Date" to NYSEGBackOffice@NYSEG.com with the following information: Your name, the service address, your NYSEG Account Number, and the month that you would like your contract “true-up” month to take place. With solar, your NYSEG bill will look a bit different. Instead of one line showing how much electricity you bought from the utility in a given month, you will now see two lines - one showing what you bought and one showing the solar electricity you sold back. The difference between these two lines is what you are billed for or credited for in the month. Please see an example here. Please note that the solar electricity you sold back is not the total production of the system, as some solar electricity is used immediately on-site. You will also notice that the one thing missing from your new NYSEG bill is an easy way to see your net-metered credit to date. We have requested that NYSEG provide this key information as other utilities across the state do, and they have agreed to do that but we are still waiting on a confirmed date of when that change will take effect. NYSEG typically measures your electricity usage only every other month, and estimates in the remaining months. For homes adding solar, NYSEG continues this practice but these estimates become very inaccurate and unreliable. The estimates are typically too high, not accounting for the reduced usage resulting from your own solar electricity production, and this means that NYSEG will send you a bill when you otherwise would not have one. They will take an actual meter reading the next month, but you end up paying monthly charges 6 months out of the year that you should not. Also as mentioned above, if this happens any extra net-metering credit you have at your Anniversary/True-up Date will be valued only at the wholesale rate as opposed to the retail rate you would have received during the year had NYSEG not misestimated. Thus for solar customers, estimated meter readings should be avoided because they can elevate your energy charges and reduce the value the solar is delivering. The solution for now is to read your own meter once a month and report that to NYSEG. Visit NYSEG's Meter Reading Info Page for more information about reading your meter and you can set up your online NYSEG account to send you a reminder to do this if its helpful. As a solar customer, your NYSEG meter is digital and simply has two readings that you report just like the two lines on your new bill. Currently you can email in the readings to NYSEGBackOffice@NYSEG.com. We are working to move the utilities towards using automated meter reading systems as a long-term solution to this issue, but for now this is the best alternative.